This lesson is very informative and eye opening. Strongly recommend to any earth science students or teachers regardless of branch. Fascinating course! Learned so much! it was good lesson and i enjoyed it. This one was a little bit harder. this is on the job training, and education, for me. A nice overview of the impacts of volcanic ash from the point of view of weather forecast and climate. 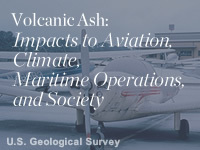 This module gives useful information on the impacts that volcanic ash, gasses, lava flows and other volcanic emissions have on travel, weather, and health. November 6, 2013: The Fall 2013 update includes additional impacts information related to the eruption of Chile's Puyehue Cordon-Caulle volcano in 2011, Iceland's Eyjafjallajokull volcano in 2010, and New Zealand's Mt. Tongariro in 2012. New content and graphics are included in the Aviation Impacts and Maritime Impacts sections. The Societal Impacts section updates include new information on agricultural effects and brand-new content focused on Outgassing and Acid Rain.